Unfortunately as these would-be founders quickly discovered, there’s a lot more to starting a community site than the idea and technical execution. Regrettably, that’s why I don’t see much of a future for Telescope, which is a site that allows you to “create a Product Hunt / Hacker News clone in 1-click”. Looking through the showcase and seeing nothing but expired domains of dead projects and ghost towns with zero comments, it’s abundantly clear that the tech behind community sites isn’t what moves the needle. 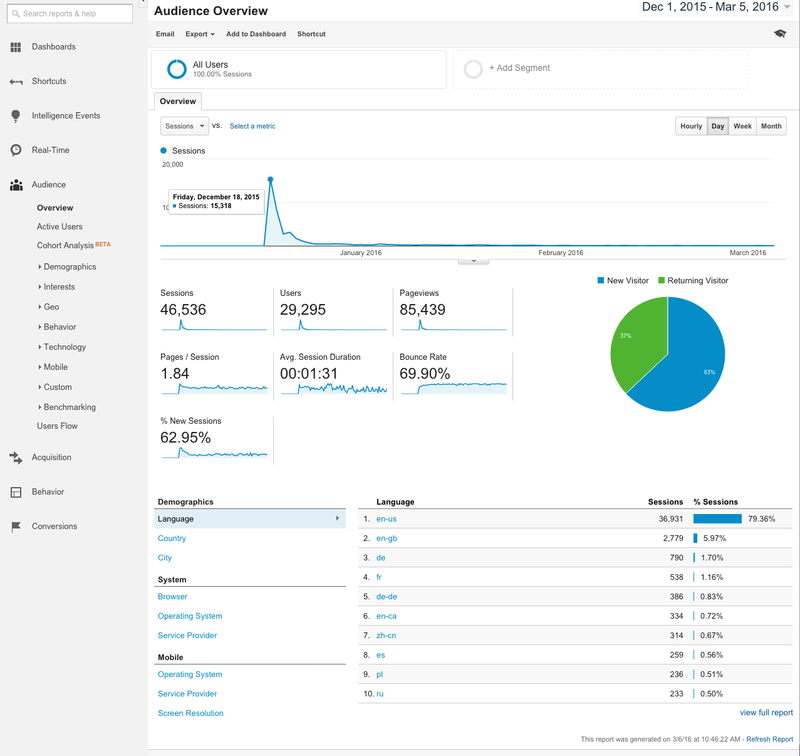 Close to 30,000 unique visitors and yet the site still flopped. So clearly even a (humungous) one-time traffic spike isn’t enough to keep a community site afloat. As a software consultant, I get pitched community-based business ideas left and right. Each time so far I’ve declined though, because after drilling down into the details with the founder it’s clear that they are out of their depth. After the third or fourth time this happened it got me thinking — what does it take to successfully launch a community site? Being a fan of internet archaeology, I decided to do some metaphorical digging into Product Hunt and Ryan Hoover, Product Hunt’s founder. While these points are nice, it’s unlikely that they made much of an impact on anyone back in 2011 when they were published. The reason is simply that Ryan had written them before he had ever actually built a successful community. Now that he has, we’re going to walk through each tactic step-by-step and show exactly how Ryan used these techniques in 2013 to successfully launch & market Product Hunt. #7 Founder of a startup acquired by Yahoo! 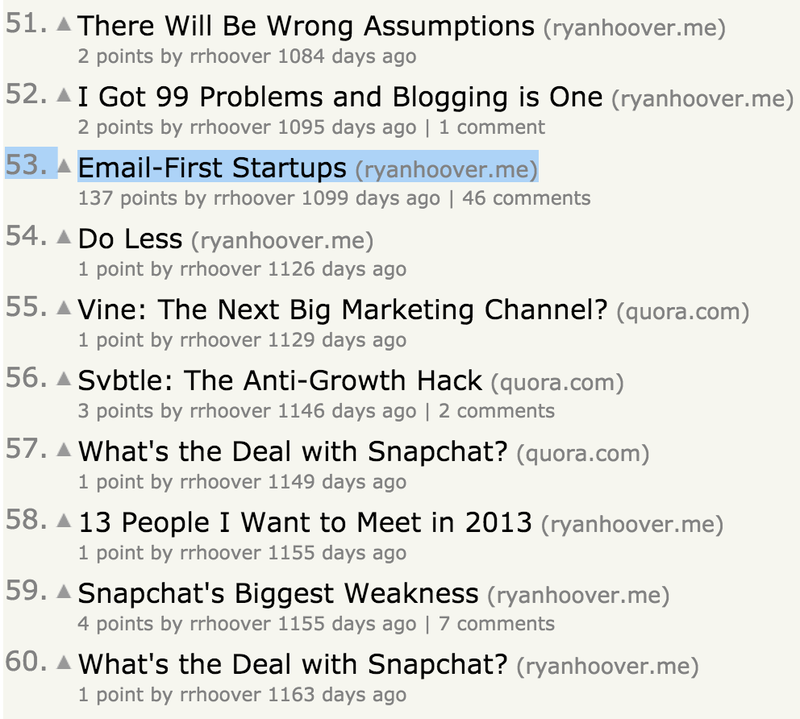 Startup Edition (archived copy), which is now offline, was an email list with “Weekly wisdom from founders, hackers & designers” organized by Ryan. Each week would pose a new question that all the influencer participants would then write a blog post answering. Examples include “How did you choose your pricing model?” and “What advice would you give to young entrepreneurs?”. With Startup Edition, Ryan had an “excuse” to contact influential people he didn’t know and build a relationship with them. The key is that this “excuse” needs to benefit the influencer as well to get them interested. In the case of Startup Edition, the benefit to the influencer is more publicity for their post plus getting a unique chance to compare & contrast their ideas with other influencers that they might not know either. In essence, this made Ryan into a connector and helped him rapidly build his network. Another person who has written about this idea is Tim Ferriss. He often repeats that volunteering for a Silicon Valley charity got him an “excuse” to engage with influencers, in his case to organize events involving the influencer. Whatever the specific method, the key is getting your foot in the door so that future interactions won’t be a cold-open. Other possibilities include running a podcast (no coincidence there is now a Product Hunt Podcast), doing traditional written interviews, or freelance writing for an existing publication (added bonus: getting an automatic boost from that publication’s credibility). Know any other tactics? Mention them in the comments and I’ll add them here. 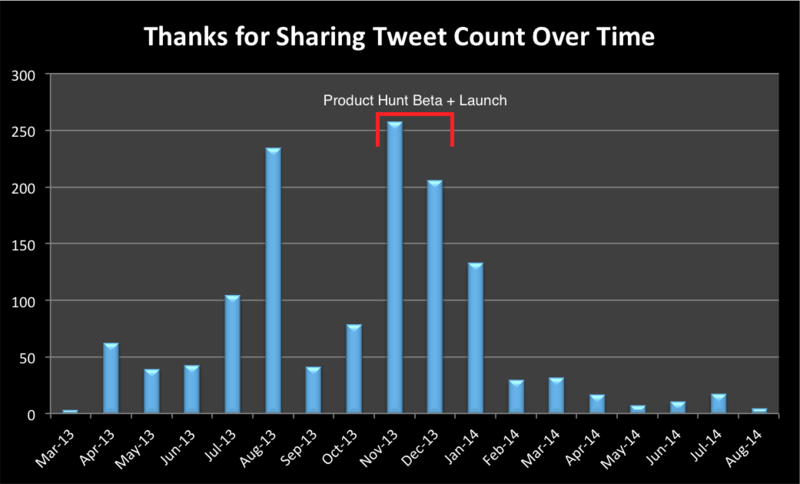 Specifically, in my research I was shocked to learn how Ryan leveraged a simple (but not easy) tactic to more than triple his Twitter follower count (1219 to 3868) over the course of the 8 months leading up to Product Hunt’s public launch. 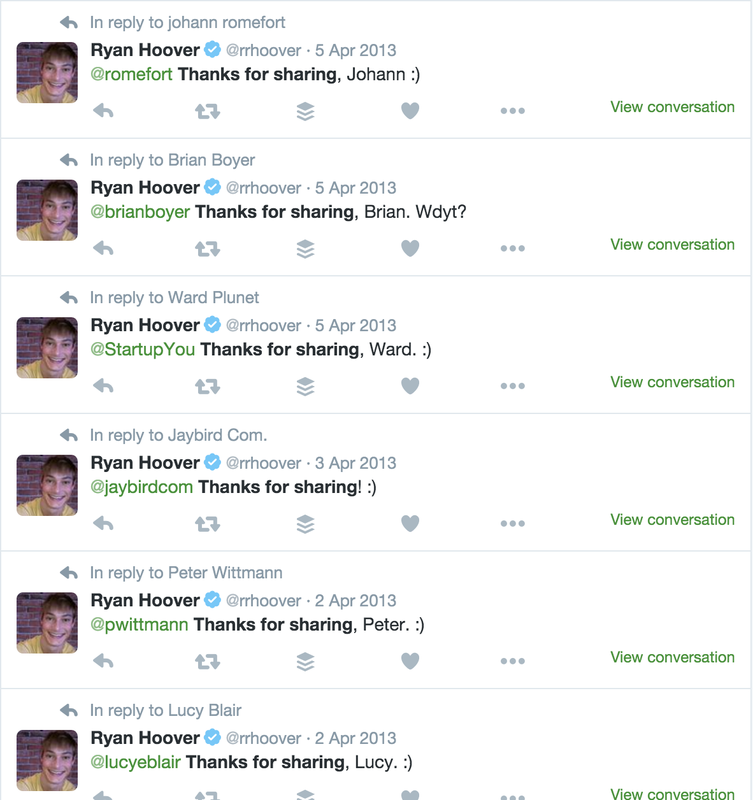 In total Ryan sent out over 1,300 individual “thanks for sharing” tweets to people on twitter, 1,073 of which occurred from March 2013 through December 2013, when Product Hunt launched. For fun, I compiled a 13.3MB 594 x 154590 pixel image of all 1,327 tweets. I use it to inspire myself to power through the dull-but-necessary grunt work required to achieve anything significant. If you’d like to do the same you can download the image on my website. Just make sure to open it in Preview (or your OS equivalent) since it’s humungous size is liable to crash Chrome/Firefox/etc. 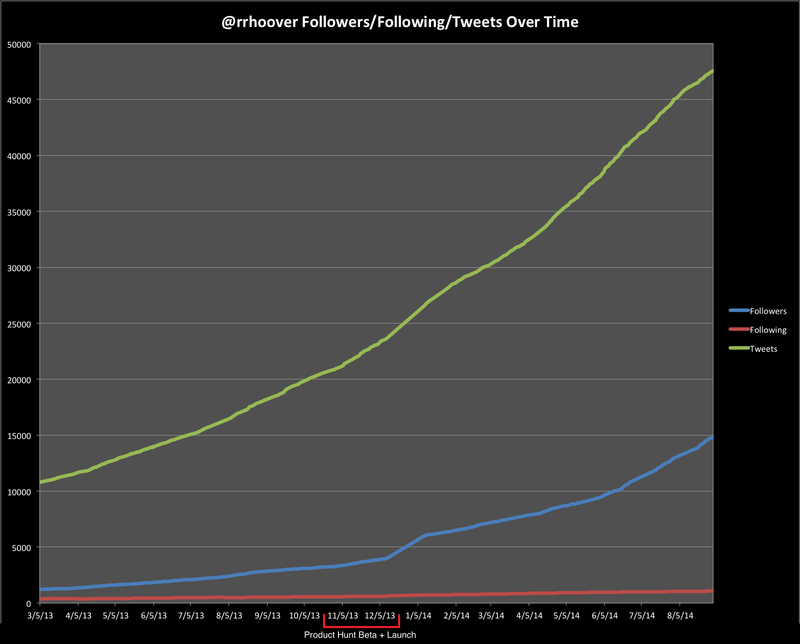 From the source data (downloadable here), we see that from March 1st, when Ryan started this technique, to December 4th, when Product Hunt publicly launched, Ryan more than tripled his follower count from 1219 to 3389. During this same period he tweeted 12,382 times where 1,073* (or 8.6%) of which were the “Thanks for Sharing” tweets (*if we included follow-up tweets this would be even higher). Seeing as prior to March 2013 Ryan had tweeted 10,801 times and only acquired 1,219 followers it is clear that this period of tweeting was dramatically more effective. Though we don’t have the data, it’s likely that Ryan’s email list at least tripled in size over this period as well. The end result of all of this is that on day 1 when Ryan tweeted announcing Product hunt he got over 150* people to click through and check out the Product Hunt email list beta (*across https://bit.ly/1hMVzkQ+ and https://bit.ly/1iMUK9q+). Since this coincided with a post on Ryan’s blog, he definitely emailed his list as well. At a 58% open rate and 23% CTR on average for Ryan’s list, we can speculate he easily got a few hundred other visitors to check out Product Hunt on day 1. Ultimately this led to over 170 people subscribing within the first two weeks and the clear momentum to build out the full-featured version of the site. The power to cheaply and easily get your message in front of hundreds of targeted people cannot be understated. Buying ads on a large platform like Google AdWords or Facebook to achieve the same result could easily cost a few thousand dollars each time. While this isn’t a big deal if you’re sure about your current idea, in reality your first idea is almost certainly wrong (Ryan talks about a few of his earlier unsuccessful ideas here). By starting Product Hunt off as an email list rather than a full-blown comment-enabled community site, Ryan was able to make the site useful without users. Even if he couldn’t find outside contributors to submit links (which he did), it would have been simple to find all of the links on his own each day. Definitely much easier than creating fake accounts and fake comments like the founders of Reddit did in their early days. Tying back to technique #2 (Indulge Early Adopters & Listen), this points to the volume of writing output that building an audience actually takes. And while there are certainly some super-humans who can find the time to write regularly & voluminously despite being full-time employees (one of whom is Ryan), anecdotally I’ve noticed that more often it’s consultants and bootstrapping entrepreneurs who tend to publish a lot of high quality content online. As stated earlier, with the audience that Ryan had built over the previous year it took him two weeks to reach 30 contributors and 170 subscribers. This demonstrated that Ryan wasn’t a ‘wantrepreneur’ and provided the key momentum necessary to get Nathan, his designer/developer partner, on board to actually build out the full-blown community site. Invites are a tried and true tactic — everything from GMail, Pinterest, Spotify, to even Medium itself began as invite-only sites. While it sounds like a “well duh” tactic, in practice it is painfully hard to actually execute. It’s when your community has just a sprinkling of comments and is walking the knife’s edge between success and failure that your mettle will be tested. Though it can be painfully tempting to abandon the invite system and open the traffic floodgates, that would be a mistake. 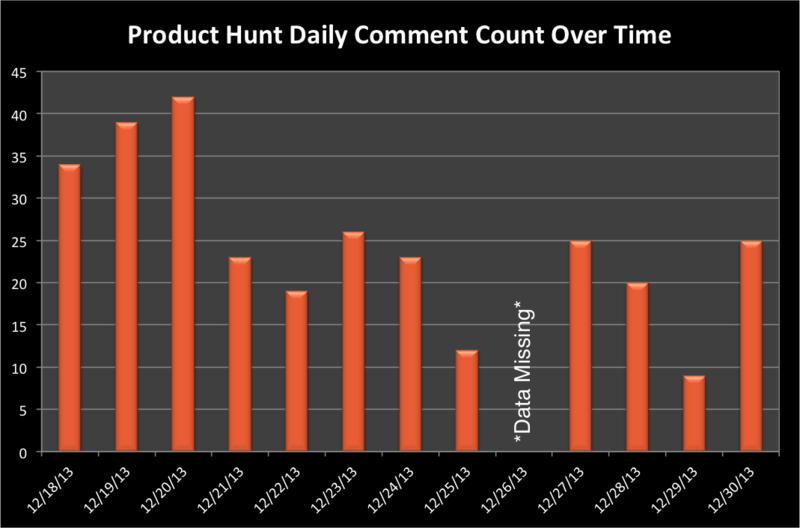 In Product Hunt’s case we see the number of daily comments (in the 7 highest upvoted stories) range from a high of 42 to a low of 9 during the latter half of the first month that Product Hunt existed as a full-featured community site. Despite the roller-coaster engagement graph, Ryan and Nathan stayed the course and maintained their invite system. Ultimately this keep comment quality top notch and the signal-to-noise ratio high. This is a perfect example of Paul Graham’s “Do things that Don’t Scale” concept which he popularized in July 2013. While Ryan wouldn’t be able to keep this up forever, in Product Hunt’s early days it was essential to tilt the scales in his favor. 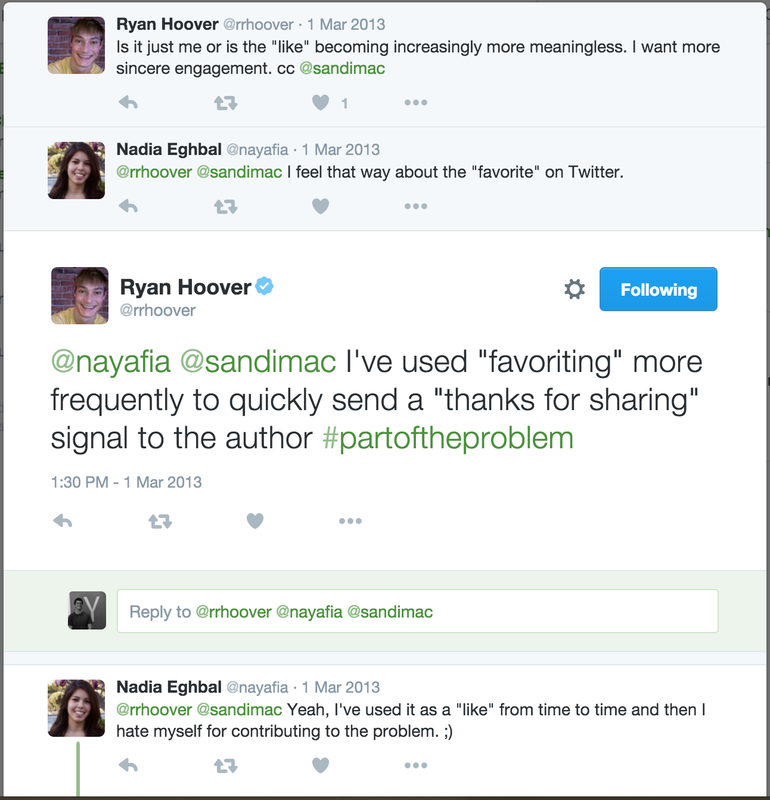 Ryan in 2013: By tying Product Hunt logins to Twitter handles, Ryan firmly associated Twitter as the primary sharing medium of the site. Today you see this yourself by simply searching “we’re on product hunt” on Twitter. Like all community sites, the fact that more upvotes leads to more views for the product heavily incentivizes the creators to share with their audience (though the rules do forbid explicitly asking for upvotes). This allows Product Hunt’s marketing to scale with its userbase, which is how the site was able to skyrocket into the top 3,500 most popular websites in the USA (per Alexa ranking). 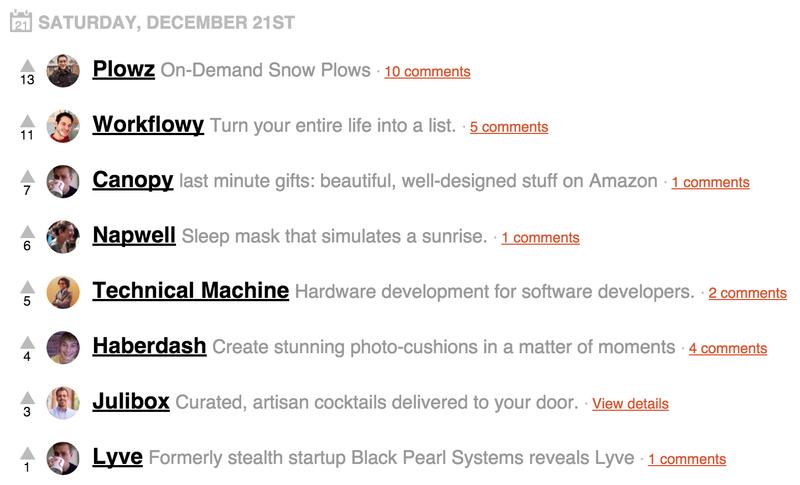 In 2015, close to +40 Products are debuted on Product Hunt each and every day. This leads to a diverse set of easily over 100 people eager and ready to share links to their product on Product Hunt. Further, many of these makers are outside of Silicon Valley or even the USA entirely, thus facilitating the spread of Product Hunt across the entire world. This leads to an “aftershock effect”, leading to further publicity for both Product Hunt and the product creator after the initial launch on the main site. It’s a win-win for everyone and is a key scaling technique for Product Hunt to get exposure across a broad set of audiences. Ryan in 2013: Nobody likes an empty activity feed. In product design parlance, this issue is referred to as “Solving the Empty Room Problem”. 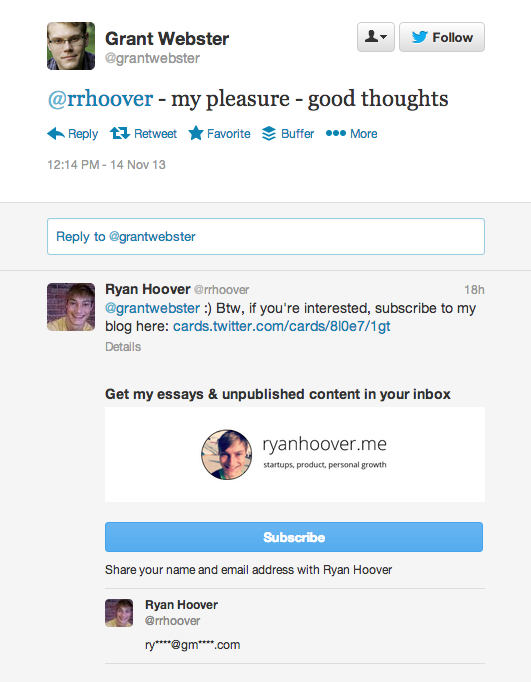 Again, Ryan elegantly bypassed this quandary tying ProductHunt logins to Twitter accounts. 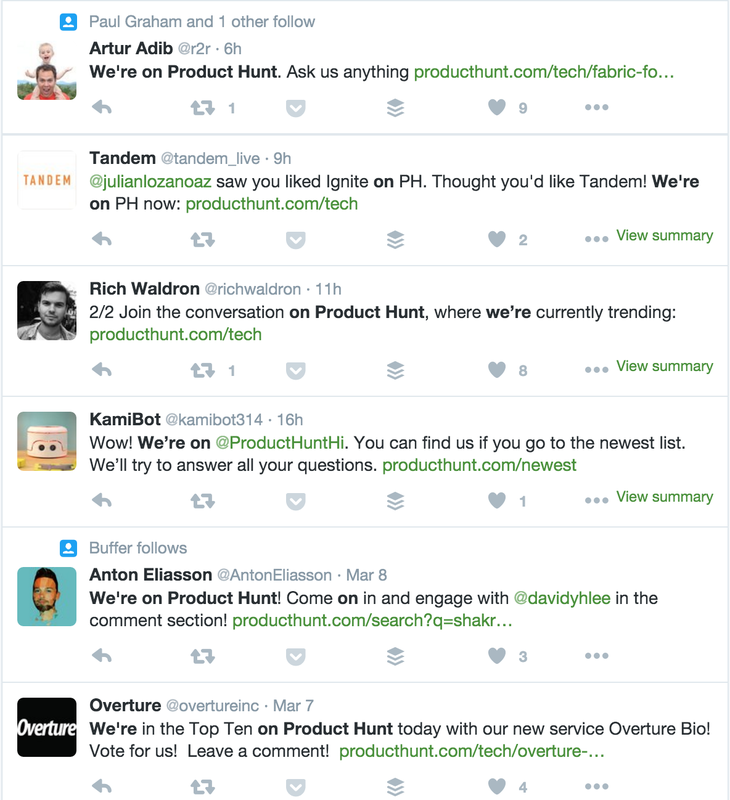 This enables Product Hunt to auto-follow all the people on Product Hunt who you are already following on Twitter. In fact, Ryan has written extensively about habit forming products, with at least five separate blog posts on the subject and even collaborating on the book “Hooked: How to Build Habit-Forming Products” with Nir Eyal (PH user #9). Once using a product becomes a habit, that user is going to stick around. And ultimately that is the key for Product Hunt’s continued long-term future growth. Grew his network of community-specific influencers using Startup Edition, his “excuse” to form a relationship with many varied influencers. Tripled his audience over the course of the 9 months prior launching Product Hunt by authentically engaging with his readers on Twitter. 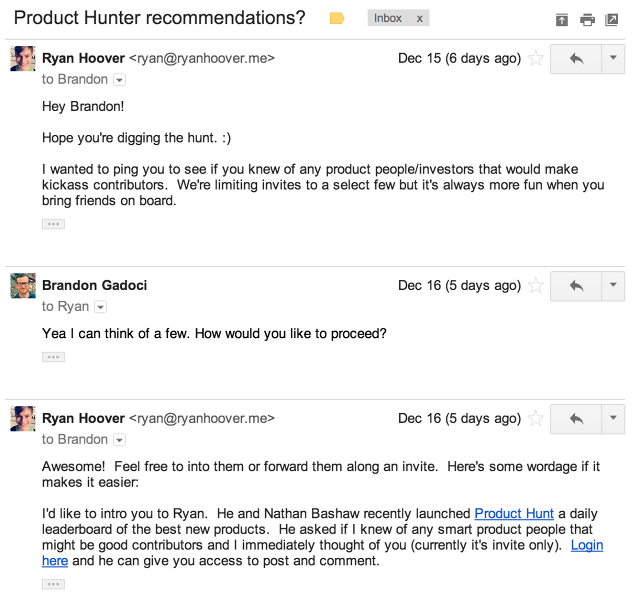 Earned critical early engagement in Product Hunt with an email-only beta he built himself. Enough to get a programmer excited to join him. Cultivated the early seeds of his community through high-touch interactions with community members and an invite-only system. Most startup origin stories start with step #3 (when active work on the project began). Hopefully by showcasing the things that Ryan was doing over 2.5 years before founding Product Hunt, I’ve shown a new side to his story. If you made it this far, I’m guessing you like Internet Archaeology. Join the club now to get involved with our next dig, spots are filling fast.